Rejuvenate your complexion with targeted treatments designed to treat the delicate eye area and tackle puffiness, crows feet, dark circles, and drooping skin. Dr. 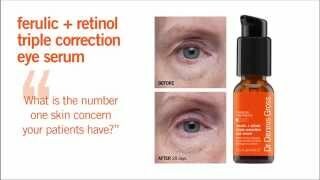 Gross explains how his patients' number one concern, their eye area, can be made to look younger with his multi-functional Ferulic + Retinol Triple Correction Eye Serum. Why Is Eye Treatment Important? What Ingredients Should I look For? What Are the Benefits of Retinol? It’s important to look for a product specifically formulated for the eye area because the skin is delicate and especially thin, therefore it is more prone to lines caused by daily facial expressions and sun damage. The skin can be more easily irritated and may be more vulnerable to products that are too strong. This area requires specially formulated treatments that are strong yet gentle. I don’t advocate products with just one active ingredient. If we know 10 ingredients that can help treat lines, I want all 10 in one bottle. Look for products that contain multiple antioxidants and ingredients that will help firm up the eye area, including retinol, as well as prevent future damage from occurring. Retinol is an ideal ingredient for anyone who is serious about anti-aging, especially around the eye area. It is a naturally derived form of vitamin A which is very compatible with the skin. This potent anti-aging ingredient helps smooth wrinkles and lines while increasing moisture and elasticity. It also promotes the production of new skin cells and helps fade dark spots. For the most part, dark under-eye circles are the result of lifestyle habits such as smoking, drinking too much caffeine, overindulging in alcohol and not sleeping enough. Nicotine, alcohol and caffeine cause the capillaries to leak iron and blood cells into the under-eye area, giving it a dark appearance.